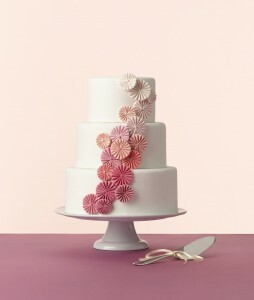 This cake is modern and girly and oh so fabulous! The pink pinwheels are the perfect accent for the simplicity of this white cake. And I absolutely love the pink ombre coloring that Erica O’Brien Cake Design, of Hamden, Connecticut used to accent the cake. Ombre coloring is all the rage from hair color to clothing to party decor and even cakes. And it is executed perfectly here. Not too much pink but jut enough to bring some color without overpowering the clean, fresh look of the white cake. And using pinwheels gives the cake a whimsical feeling that completes this incredible cake!